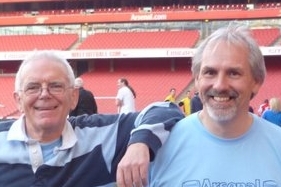 “What do you know about the history of football?” I asked Billy the Dog McGraw with some nervousness when he announced that he intended to contribute to the “Making the Arsenal” blog rather than the contemporary “Untold Arsenal” where he usually resides. “The club was formed in 886AD ,” he said with a certainty that is hard to contradict – at least not when dealing with a man of Billy’s size, “with the motto ‘exsisto patiens’. We played our first game on Christmas Day, just before lunch. Alfred the Great came to watch the first match and there was some crowd trouble during the second half between the Danes and the Wessexians. “Liverpool will use the pas d’armes style of play, employing the hastilude approach, as they traditionally do,” he announced calmly eying up the barmaid (for we were in a public house of limited repute) and he fancied his chances. I drew him back to reality (no insignificant task) and asked for explanations. “This involves a group of players shouting “Kalm Down” in very loud voices as they stand around the goal, and let it be known that any player of the other team (known as the venans ) must first fight, or be disgraced. “You’ve been reading that book on jousting again haven’t you,” I said but Billy had eyes only for the barmaid. She however appeared to have interests elsewhere, and who could blame her? “So what about the team?” I enquired trying to conclude the interview so I could write it up and then toddle over to Sky Sports News to give them the data. “Stuart Taylor, Sylvinho, Kolo Toure, Patrick Vieira, Emmanuel Adebayor,” he said. Subs likely to appear at some stage during the entertainment: Theo the Theo, Diaby the not Vieira, and Bendtner the man who the guy behind me in Block 99 absolutely hates and wants everyone else in the whole bloody stadium to know his views, and I am getting so pissed off with it I am going to ask to be moved somewhere else in the ground. The score: 6-1 to Arsenal. (c) Billy the Dog McGraw, Victim Support Services, The Bedlam, Chelsea. I sussed you out! You’re pulling our legs! You almost had me until “Clichy the Defender”.